Kami Glass is an ordinary girl with a best friend and normal family living in England, but there is one exceptionÉ She has an imaginary friend, Jared, who has been her imaginary friend since childhood and who has always been there for her. Kami has never really ever felt alone since she has consistently has Jared present in her mind. Nothing would or could tear them apartÉ until now. At school a fight breaks out involving the basketball team and the new student named Jared Lyndburn. While at the library, Kami is forced to be in the same elevator as Jared when leaving, which is ironic since she had been talking to Jared in the library. In the elevator she continues talking to Jared in her mind. When she asks him what he's doing, his response is, "Stuck in an elevator with some Asian chick." They both realize that they aren't just imaginary friends, but they are both real and alive! How will this change the way Kami feels about Jared? As mystery and suspense surround their sleepy little English town, will a curse bring Kami and Jared together? Or will it tear them apart? 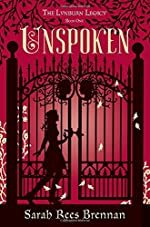 Unspoken by Sarah Rees Brennan is a book that will captivate teens around the world with the familiarity, love, and humor, which is exactly what she does when she creates a safe haven for teen's to go and share Kami Glass's feelings. She adds the extra spice to the recipe making it a twist of, The Beautiful Creatures series by Marcia Garcia by incorporating the dark sorcerer and the journalistic writings of any reporter. One of the most attractive aspects that teens will find is the difference in characterization which is created through descriptive details. Along with the curses used throughout the book, Sarah Rees Brennan brings the familiar happenings of a high school teenager's life along with the spectacular story line and plot her fictional writing creates. She finishes every chapter with a cliffhanger, making you need more of her intellectual writing enforcing the fun, bubby, and gothic persona. Teens all over will just soak up the book eagerly awaiting the next book to come, as am I. She definitely gave me an escape from my life, welcoming me with warmth into her story. I often found myself making connections to how I feel with my friends, which is how Kami often compared herself with her best friend, Angela. She constantly feels dull in relation to her best friend's exotic, gorgeous, and confident self. I sped through this book like no other, needing to find what happened next and I know you will. I give Unspoken by Sarah Rees Brennan two thumbs up along with five stars for the entire book being engaging and just an overall a book that males and females will enjoy. This book creates room for people to agree and disagree on Kami's or any other character's actions or feelings bringing a controversial conversation to any room. I absolutely can't wait for the hopefully several books to follow with the bar set really high! Sarah Rees Brennan is a skilled author who lured me in with her writing and will for sure reel you in as well. I, as well as anyone else who read this book, laughed, cried, sang, and danced along with the characters who endure the adventures they do. With two thumbs up and five stars this book will go extremely far! We would like to thank Random House for providing a copy of Unspoken for this review. Have you read Unspoken? How would you rate it?